Meet Stana, she is the star of the hit series, CASTLE ! Evidently, Stana Katic, and her small screen alter ego, Kate Beckett have more than just mesmerizing good looks and a killer smile in common on the ABC Series. As luck (or hard work) would have it, Katic is that rare hollywood specimen that has the brains to match the beauty. 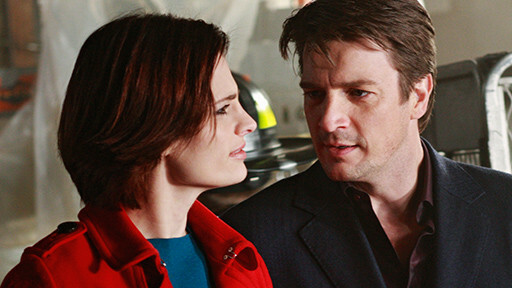 She co-stars with handsome Nathan Fillion. The show grabs you in with on screen chemistry,charming humor and stunning good looks. Stana, has an all American yet devilish fashion style . She can change makeup and hair color but still look amazing. You've probably seen Stana in 24 Heroes and recently in the James Bond Quantuam of Solice. Soon she will be staring in a new spy thriller "The Double" with costar Richard Gere. Stana is 32 years old, born in Hamilton, Ontario, Canada. Her family moved from Canada to Illinois. After graduating from West Aurora High school in 1996, she studied acting at Chicago's Goodman School of Drama. In addition to English she speaks Sergo-Croatioan, Slovene, French and Italian.